Eugène Louis Boudin, who was born in Honfleur on July 12, 1824, was one of the first few landscape painters in France to do outdoor painting. He was a marine painter and was considered an expert in depicting everything that has to do with the shore and the sea. His father was a harbor pilot and at the tender age of 10 Boudin was working on a steamboat. When he was 11 years old, they moved to Le Havre and his father opened a stationery and picture frame store wherein his son worked as well. Father and son left seafaring behind and concentrated on their store. Young Eugène might have abandoned it but he retained the characters of a sailor: open-hearted, accessible and frank. Eugène Boudin also opened his own picture frame store, which allowed him to come into contact with several artists working in Le Havre. He exhibited paintings done by Jean-François Millet and Constant Troyon in his shop. He also met history painter Thomas Couture and miniature painter Jean-Baptiste Isabey and all of them encouraged Boudin to pursue a career in art. He was 22 when he started to paint full-time. In 1845 he traveled to Paris and then to Flanders. Five years later he got a scholarship and was able to move to Paris, although he frequently went back to Normandy to paint. From 1855, Boudin also made several painting trips to Brittany. Major influencers in Boudin’s style were the 17th century Dutch Masters, and when he met Johan Jongkind, who had conquered the artistic circles in France, the Dutch artist introduced Boudin to en plein air painting. Boudin at that time was also working with Isabey and Troyon. He met French Realist painter Gustave Courbet in 1859 who introduced him to art critic Charles Baudelaire. He was the first art critic that brought the talent of Boudin to the attention of art lovers when he debuted at the Paris Salon in 1859. A year or two before his Paris Salon debut, Boudin met and became a friend of the 18-year old Claude Monet. He persuaded Monet to go for landscape painting instead of doing caricatures. He taught Monet how to capture the play of light on water and instilled in him to love brighter hues. Boudin’s teachings were seen in the Impressionist works of Monet. The two remained friends for life and Boudin even joined Monet and other young artists in his first exhibition of his Impressionist canvases in 1873. Due to his fine reputation, he was able to travel to several places starting around the 1870s, visiting Belgium, southern France, the Netherlands and Venice. He also regularly joined the Paris Salons and even placed third in 1881. He later won the gold medal at the Exposition Universelle in 1889 and was made a Légion d’honneur knight in 1892. 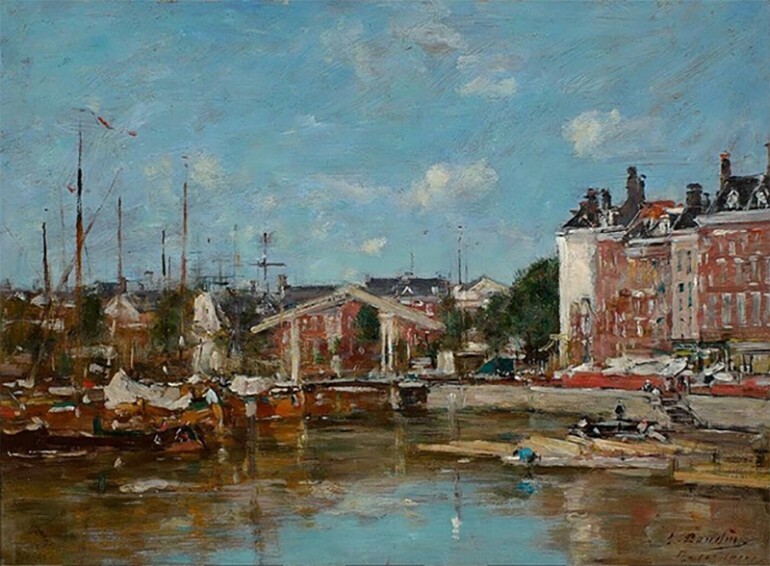 Many considered Eugène Boudin as a link between the landscape painters in Camille Corot’s generation and the Impressionist painters such as Alfred Sisley, Renoir and Monet. Boudin was a plein air painting specialist while still in Le Havre and introduced the style to Monet when the painter was still in his teens. Boudin painted seascapes and beaches – subjects he knew by heart because of his father and his work as a young boy. 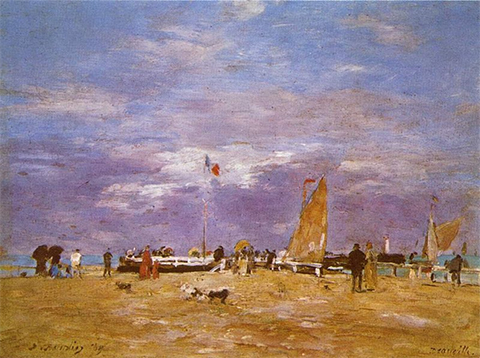 Although still unnamed at that time, Boudin’s paintings of the Normandy coast included society’s elegantly dressed people, and he employed loose brushwork while the quality of light he applied to his paintings, particularly the bright skies, were already marks of Impressionism at its early stages. Monet even wrote that it was like a veil was torn away to reveal that his destiny was to be a painter, when he was describing Boudin’s influence on him. Boudin and Monet painted together on the Normandy coast around 1865 when Monet was 25 years old. Boudin also had the habit of adding some grains of sand from the beaches where he was doing his work. Camille Corot, who was also one of Boudin’s collaborators, called the artist as the “master of the sky.” By the time 1870 rolled in, there were more painters like Monet who were painting outdoors, such as Pissarro, Renoir and Sisley. Boudin, who was 20 years their senior, exhibited together with his younger artist friends when they had their first Impressionist exhibition in 1874 in Paris. What aided painters to do open-air landscape painting was the availability of oil paints in collapsible metal tubes that American artist John Rand created in 1841. Pretty soon, portable paint boxes were offered by artist-suppliers, some of which included parasols and built-in easels. Likewise, railway lines were being opened across Europe, thus traveling to the country became easier, with the coasts of Brittany and Normandy becoming regular spots for landscape painters. Although Boudin included tourists in his paintings, he used them as representatives of a mass of people. It was seldom that he included facial details in them, and this anonymity added a touch of modernity to his landscapes.